NOTE: We do NOT custom fit these to any other knobs on your order! Replacement for "bolt and nut" machine screws. Metal caps fit into hexagonal glass knobs or pulls without changing the outside appearance - bolts screw in from the rear and provide a flush finish on both sides. Cap screws work with 1 1/4 inch and 1 1/2 inch style glass knobs and glass drawer pulls. NOTE: These may or may not work with 1 1/4 inch and 1 1/2 inch hexagonal glass knobs and pulls sold by lookintheattic & company. To guarantee a fit - they must be ordered as an option with the cabinet knob. Refer to the cabinet knob page for ordering. If ordered separately, we will not guarantee fit. 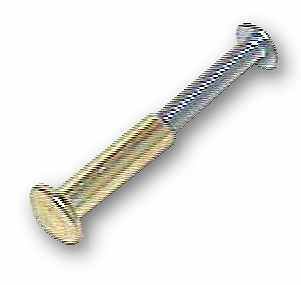 Cap screws come standard with a 1 3/4 inch bolt.